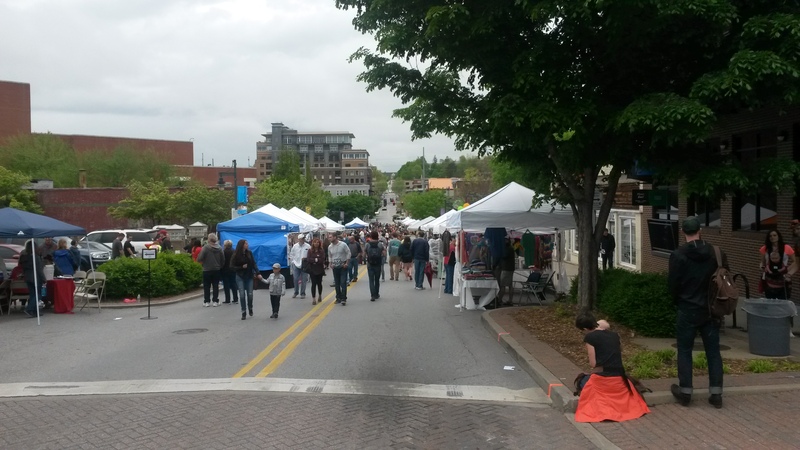 Despite the rain, we had an excellent time at Springfest 2015 in Fayetteville on Saturday. 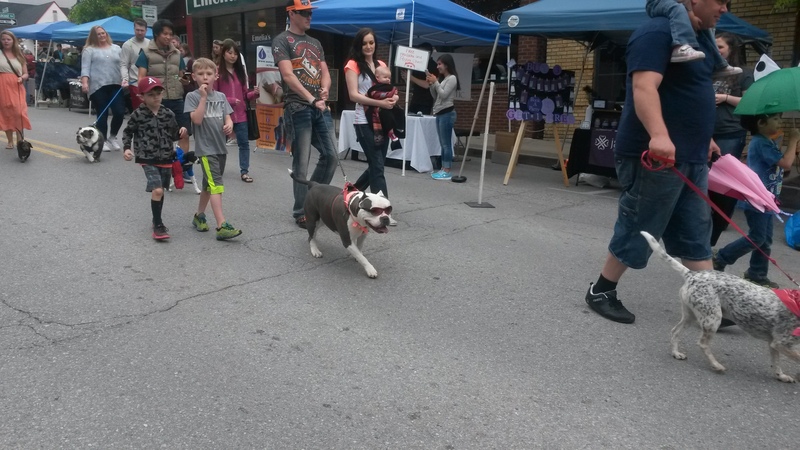 There were lots of cool vendors, live music, and a dog parade. What more could you ask for from a street fair? 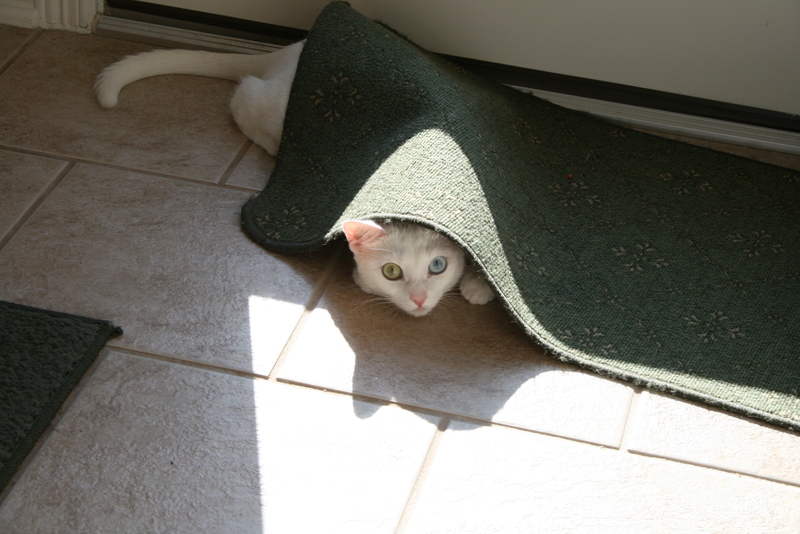 “Max’s Wild Night” was the sales leader for the day (and Kimba is pretty miffed about this). Scott (the money guy across the hall) nagged me about the “dog book” until I finally wrote it, and I’m thrilled to see it walking away in happy little hands. The new book set up with “Max’s Wild Night” now in the mix. Kids loved the Max toys! A parade of dogs highlighted the day. So many dogs in costume! I’m not sure Max would stand for that. That is one chillin’ pit bull. The view down the street from our booth. It was a people watching dream. Despite the fact that it rained for a few hours mid-day, we had nice book sales and wonderful conversations. Fayetteville is full of really delightful people! 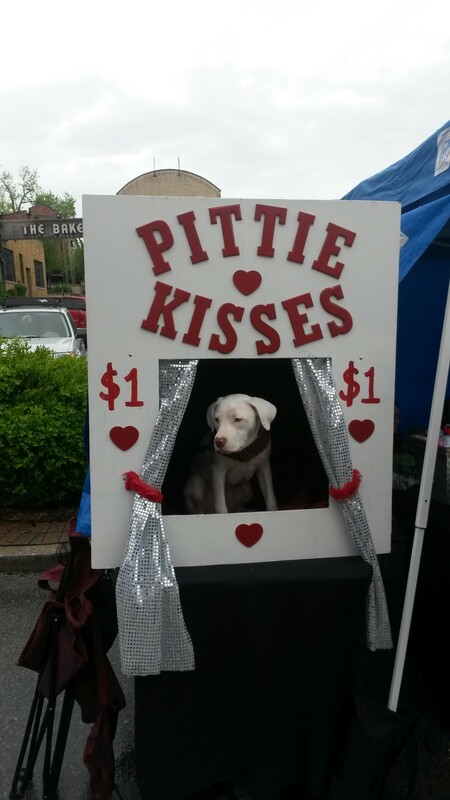 You could even get some kisses, if the mood struck you. 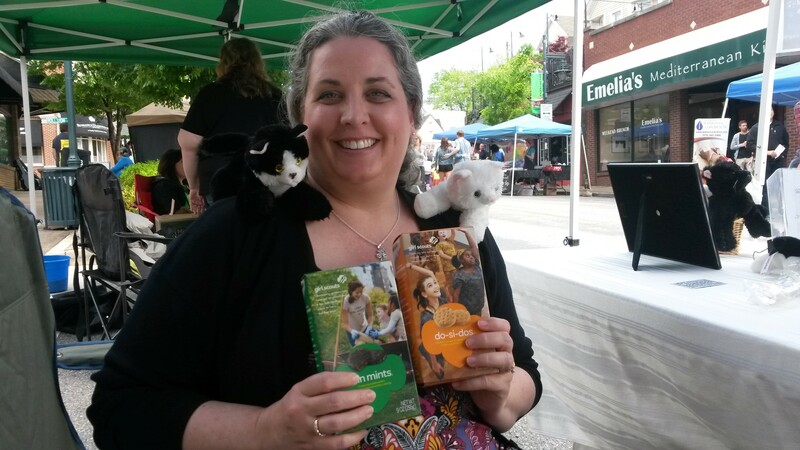 The Girl Scouts had a cookie booth next to mine. There was no way I was leaving without some cookies. Kimba and Hiro just wanted to play with the crinkle wrappers inside. It was literally their last cookie sale day of the year. Whatever didn’t sell will be donated to shelters and food kitchens. I never knew they did that with the leftovers. Wonderful. I imagine that we will do Springfest again next year. I’d love to see how busy it is without the rain. Up next is the War Eagle Spring Craft Fair in Sharp’s Field on May 1-3 (right next to the mill). I wonder if Max will be the winner there as well. I’m on target for my writing goal for “Slinky Steps Out” this month and just finished editing a delightful “coming of age on the river in the 1930s” Huck Finn-style book for Pen-L Publishing. Editing for “At the Corner of Magnetic and Main” starts in a couple of weeks, and it should be out in August. Very exciting! I’ll be sharing official release information for “Max’s Wild Night” shortly. May 1 is his birthday, so that’s our big launch date. I think we have all the kinks worked out at amazon.com and are ready to roll. Good dog, Max. We should both get a treat. 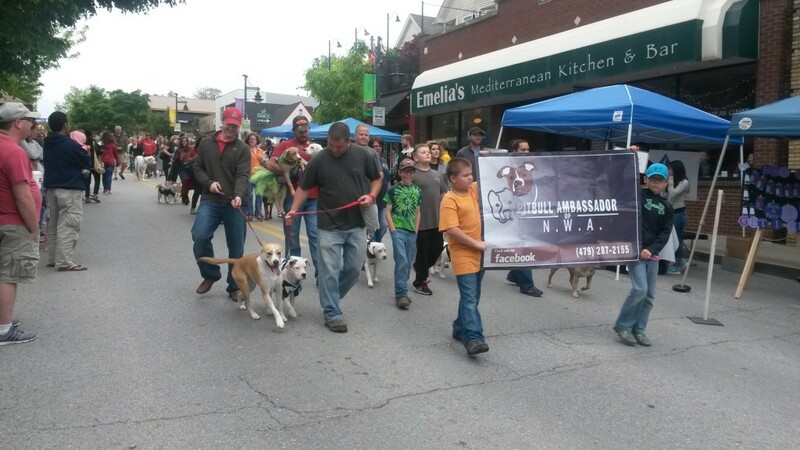 This entry was posted in Latest News and tagged dog parades, Fayetteville, Kimba, Max's Wild Night, Springfest, Springfest 2015 on April 21, 2015 by MegDendler. Since it’s National Pet Day, a quick post in honor of all of our fur babies seems appropriate. Buddy isn’t with us anymore, but he is an important character in my series so I include him in my table display at book events. Tabitha/Slinky also lives under another roof now that “Mindy” has gotten big enough to move out. Hey, that sounds like a good book plot. I’ll be posting more next week with Springfest on the horizon, but today I’m editing a murder mystery for Pen-L Publishing and writing on “Slinky Steps Out.” Preparation for the Eureka Springs Junior/Senior Prom is also beginning upstairs for “Leia.” Duck and cover, everyone! More news on the release of “Max’s Wild Night” coming very, very soon. Just waiting for the ebook formatting to be complete. This entry was posted in Latest News and tagged cats in the mirror, Eureka Springs, Hiro, Kimba, Max, Max's Wild Night, National Pet Day, Springfest on April 11, 2015 by MegDendler. We had a visitor in our house this week: Flat Stanley came to visit from Holly Academy in Michigan. He was sent by my great-niece Sage, and he had a great time helping out in the yard and with our guest house. He also hung out with Kimba for a while. 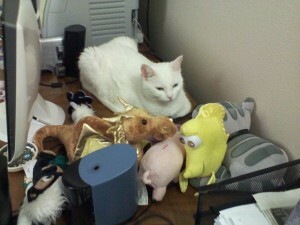 Flat Stanley hung out with Kimba in her favorite spot on the dining-room table. 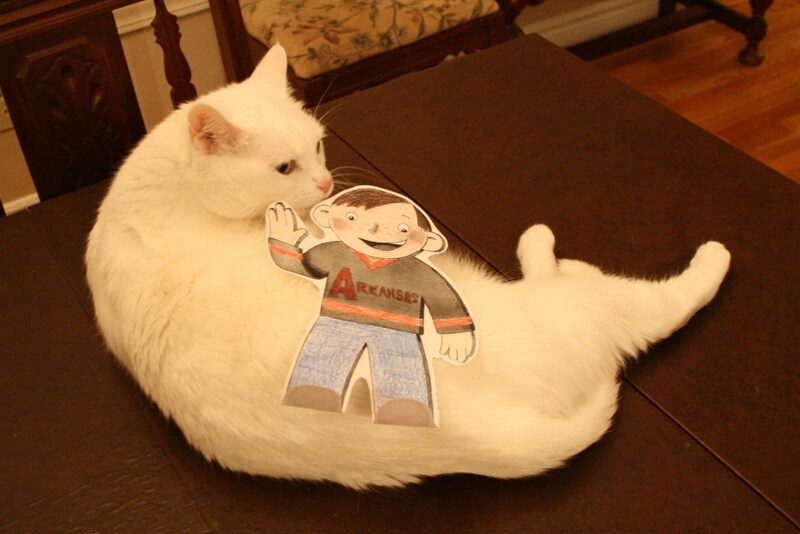 Flat Stanley didn’t have time to help me edit and revise “Miss Fatty Cat’s Revenge” before he had to return home. I imagine he would have found that kind of boring, but it’s pretty much all that I’m up to these days. Book 3 should be heading out to my new editor by April 1! The other big excitement around here is that I’m upgrading my computer and getting my own Adobe Creative Suite system so I’m able to do most if not all of the formatting for my books myself. This is the biggest expense with self-publishing, and if I can take on significant portions of the process myself it means the door is open to do more Cats in the Mirror books without ruining any profit margin. I’m grateful to everyone who has helped with the formatting along the way, but it’s time to take the next step. I was also thrilled to have “Why Kimba Saved The World” and “Vacation Hiro” listed as one of the top books about cats by Cat’s Stories web site. Check out her list right here! Next week, I will be posting as part of a fun writer’s blog hop. I was invited to join by my excellent writer friend Jan Morrill. If you have not read her book The Red Kimono, follow the link to find it on amazon.com. Here is a link to her blog post from this week. My post in the blog hop will appear here on Monday, March 31st. This entry was posted in Latest News and tagged blog hop, Flat Stanley, Kimba, Kimba Baby, Meg Dendler, Meg Welch Dendler, middle grade books, self-published books, upcoming books, Vacation Hiro, Why Kimba Saved The World, writing blogs on March 25, 2014 by MegDendler. Kimba has been tweeting for over a year now (click here to follow her personal twitter feed), but the time as come for her to have her own Facebook fan page. 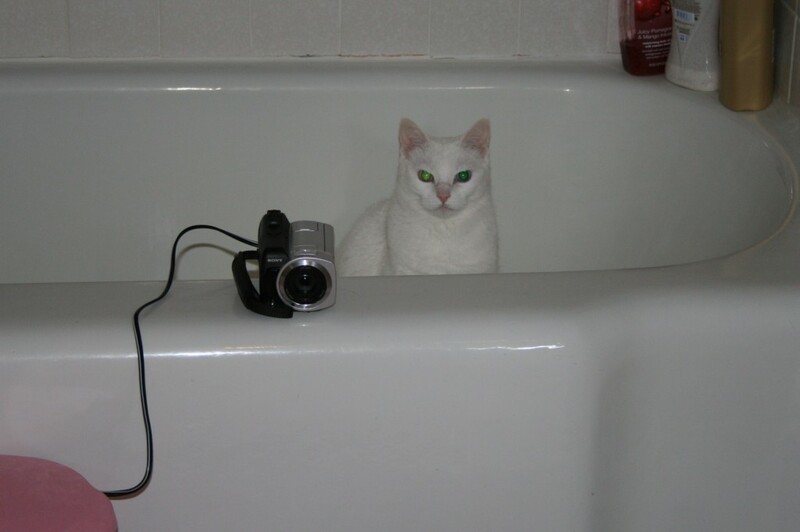 Click here to like her page and follow the silliness that is my Kimba Baby. I’m also thankful for a review of “Vacation Hiro” that was shared by the Kidz Review Krew blog site. Eleven year old Rhiannan enjoyed this book as much as the first, and I love the fact that this site is actually kids reviewing the books themselves. Stop by and give them some traffic for their other reviews! I hope y’all enjoy whatever plans you have for Superbowl Sunday. Football is fun, though I don’t really care who wins this game, but the food and family…and the commercials…are always the best part of the day for me. Kimba has already posed for some pregame photos. 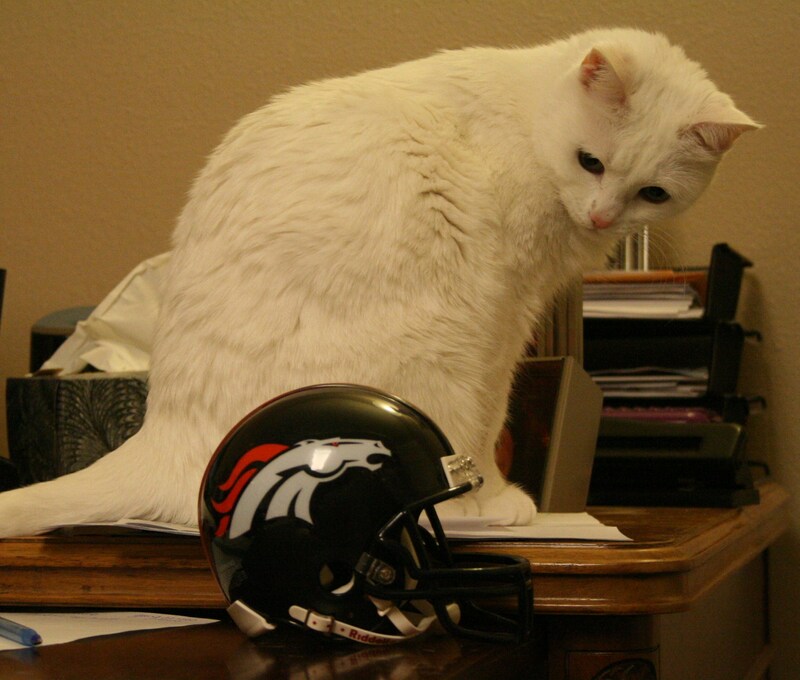 Kimba picks the Broncos to win because she’s pretty sure even she could beat a Seahawk. By Sunday I should also have a completed rough draft (okay, very rough draft) of “Miss Fatty Cat’s Revenge.” That’s more exciting than ANY football game, ever! This entry was posted in Latest News and tagged books about cats, Facebook, Facebook Fan Pages, kid lit, Kimba, Kimba Baby, Meg Dendler, Meg Welch Dendler, middle grade books, Twitter, upcoming books, Vacation Hiro, Why Kimba Saved The World on February 2, 2014 by MegDendler. On Thursday, January 9th, I spent a wonderful day with four different groups of students from The Branch School during a visit to Houston, Texas. As a self-published author, school visits are not on the top of my focus list because they want more traditional authors, but I had many friends at this school from working there as a substitute teacher and temporary librarian a few years ago and was happy to accept their invitation to stop by. It was an absolute delight to see those familiar faces more grown up and make so many new friends. More on that visit later as I get photos in next week. What was really hilarious was to watch a video of Kimba with the 3rd and 4th graders. It is one of my favorites of her, and it took many days of clandestine video monitoring to catch her in the act of stealing my stuffed Disney toys and carrying them around the house, singing. The first graders also watched it during lunch and were very excited to tell me about their favorite parts. All of them did a great impersonation of Kimba singing “Hello!” You can watch the video of Kimba carrying around my stuffed toys and singing right here. Be sure to have the volume on. If you have a cat anywhere in the house, I bet he or she will come running once the singing starts. As cat videos go, I think it’s right up there with the best. I ran across this photo today from about the fourth day of my secret video taping mission. I think she’s on to my plan. Enjoy the video! This entry was posted in Behind The Scenes and tagged books about cats, Cat Videos, children's books, crazy cats, cute cats, Disney Cats, kid lit, Kimba, Kimba Baby, Meg Dendler, self-published books, silly cats, Singing Cats, Why Kimba Saved The World on January 12, 2014 by MegDendler. The last official stop on my fall blog tour is a book review for “Why Kimba Saved The World” at the blog of Erik The Great: This Kid Reviews Books. Follow this link to his nice review of “Kimba.” I love it when a review comes from a reader who is closer to the actual intended target audience of my middle grade books. Adult reviewers sometimes over-think the process. Kids will just tell you whether or not they liked it. In the end, that’s what it’s all about. Erik’s blog is full of delightful reviews and commentaries on the books he has enjoyed. He has very mature taste for an 11 year old, so I’m glad he could still enjoy the simplicity of my book. I’m happy to be including him in my blogroll so visitors to my site can find his as well. I sometimes worry about how much time I spend trying to figure out Kimba’s thoughts, but at least it paid off for my books. She is sitting outside my office door right now, and I have no idea what she is plotting. A good bath and a nap are probably all she has on the agenda, but you never can tell with cats. I hope you will visit the sites of all of the bloggers who were kind enough to do interviews and book reviews of either “Why Kimba Saved The World” or “Vacation Hiro” (or both!) as part of this Fall Blog Tour. There will be a few more reviews along the way with others who have not set firm dates, and I will keep sharing them! This entry was posted in Book Review and Commentary and tagged book promotion, book reviews, books about cats, children's books, Erik The Great, kid lit, kidlit, Kimba, Kimba Baby, Meg Dendler, self-published books, This Kid Reviews Books, Why Kimba Saved The World on November 27, 2013 by MegDendler. 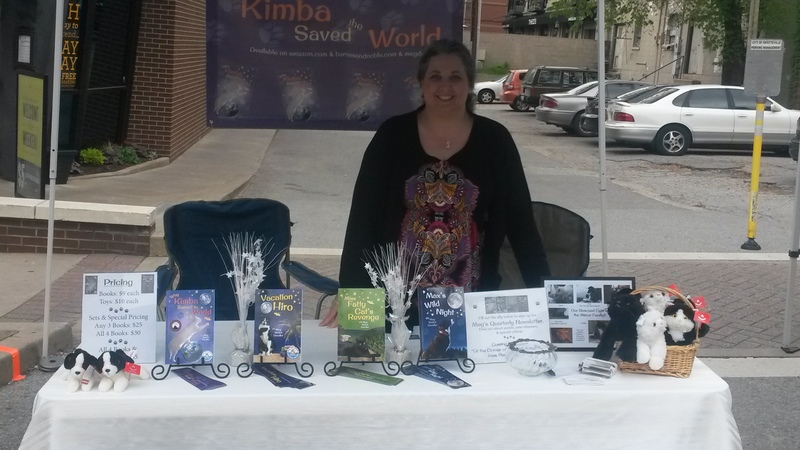 The blog tour continues today with a book review of “Why Kimba Saved The World” at Say What Savannah Mae’s blog. Click here to see the whole review. This entry was posted in Book Review and Commentary and tagged blog tour, book promotion, book reviews, books about cats, children's books, kid lit, kidlit, Kimba, Kimba Baby, Meg Dendler, middle grade books, Say What Savannah Mae, self-published books, Why Kimba Saved The World on November 20, 2013 by MegDendler. One special part of my blog tour was to do an author interview with award-winning writer Missy Frye for her web site. Missy and I had connected on twitter, but we had the chance to meet and chat at the Ozark Creative Writer’s Conference in October here in Eureka Springs. I love the fact that Missy asked me very specific questions about my writing life and journey (usually you just get a set of pre-fab questions). Follow this link to read the whole interview. MF: If you could jump into a book, and live in that world … which would it be? MWD: “The Dragonriders of Pern,” without question. I’ve been reading Anne McCaffrey’s books since I was 10. I love that world and her dragons and fire lizards and heroes. I can’t believe they have not pulled off making a movie out of the first books. I have a stuffed gold dragon “Ramoth” that keeps me company when I write. Kimba has pulled it behind my computer monitor to sleep with her these days, but I know she’s there. Together, they inspire me. Kimba with Ramoth and many others in her nest behind my monitor. I never know who she’ll drag back there. This entry was posted in Latest News and tagged author interviews, blog interviews, book promotion, Kimba, Kimba Baby, Meg Dendler, middle grade books, Missy Frye, self-published books, upcoming books, Vacation Hiro, Why Kimba Saved The World on November 13, 2013 by MegDendler. Unless someone I’m not expecting jumps into the schedule, and that may well happen, the next stop on the blog tour will be the very first review of “Vacation Hiro” from the Arkansas Book Reviewer. On pins and needles! This entry was posted in Book Review and Commentary and tagged book reviews, books about cats, children's books, Jenn's Book Review, kid lit, kidlit, Kimba, Kimba Baby, Meg Dendler, middle grade books, New Book, self-published books, upcoming books, Vacation Hiro, Why Kimba Saved The World on November 6, 2013 by MegDendler. Wow! I think this is the most detailed book review “Why Kimba Saved The World” has gotten so far. Reviewer Bud Scott broke it down into several categories and commented on each section. I thought it was funny that he assumed the book would be about a giant cat saving the world based on the cover. That’s the first time I’ve gotten that feedback! Click here to visit Magnolia Blossom’s blog and read the whole review and detailed interview with me. Be sure to click on the link and give their blog some traffic and read the whole book review, as well as other book reviews at the site. I’m always so grateful for the book lovers who agree to review independent and self-published books! This entry was posted in Book Review and Commentary and tagged author interviews, blog interviews, book promotion, book reviews, books about cats, children's books, crazy cats, cute cats, kid lit, kidlit, Kimba, Kimba Baby, Magnolia Blossom Reviews, Meg Dendler, middle grade books, New Book, self-published books, Why Kimba Saved The World on November 5, 2013 by MegDendler.